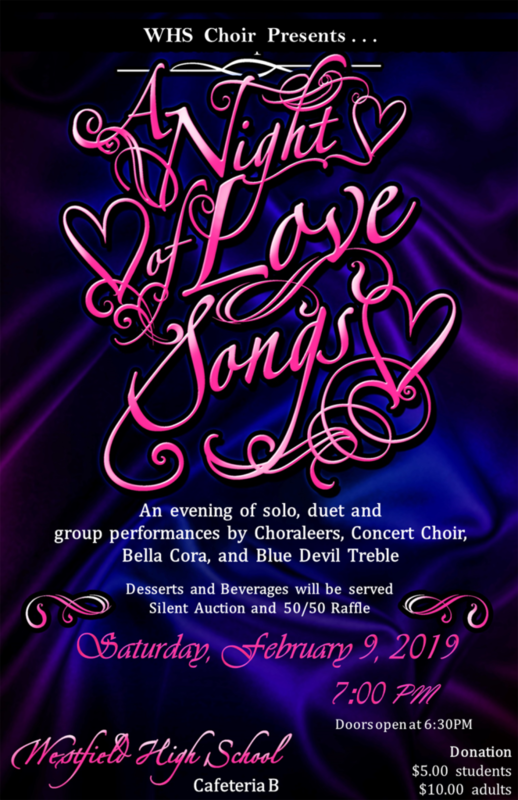 The Westfield High School Choir Department will perform  A Night of Love Songs on Saturday, February 9th, 2019 at 7:00 p.m. (door opens at 6:30 p.m. in WHS Cafeteria B) under the direction of Mr. John Brzozowski, Choir Director and Maureen Francis, Chorus Teacher. While having coffee and desserts, enjoy an evening of solo and group performances by members of the Westfield High School Choir. In addition, there will be gift baskets to silent auction as well as a 50/50 raffle. Tickets will be sold at the door and are $5 per student and $10 per adult. This wonderful event is being sponsored by the Westfield Choral Parents Association, Inc., and the proceeds will be applied toward choral performance opportunities for the students, such as trips, clinicians and special events. For more information, or to make a monetary or other charitable donation, please contact Eliana Carvajal or Shannon Costa at whsnols@gmail.com.